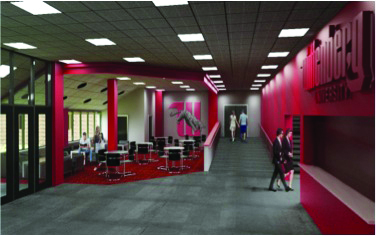 Wittenberg faculty and staff have recently shared concerns about the impact that the new Health, Wellness and Athletic Complex will have on the university in coming years as the bill continues to rise for the project. The current estimate for the project has reached $52.8 million, an increase from previous estimates of $40 million nearly eight months ago. On Oct. 24, Jonathan Eilert, chair of the Wittenberg Board of Directors, sent an email to faculty and staff updating them on the process and costs of the project after breaking ground in March. The project, first proposed in Nov. 2015, outlined a total cost of an estimated $30.6 million facility. In the coming months, both the Springfield News-Sun and Dayton Daily News updated audiences on donations and rising costs of the facility. In Oct. 2016, the cost of the project was then at an estimated $40 million. Paul Loscheider, Interim Vice President for Finance and Administration, outlined the current costs, accurate as of Nov. 28. The Board of Directors has approved borrowing of $34 million, $15.4 of which Loscheider anticipates will be paid for by tax credits. “We anticipate based on good sources of information that we will get those tax credits,” Loscheider said. Although faculty and staff have shared concerns over borrowing money to complete the project, Loscheider said the project could not be stopped, even with much fundraising still to be achieved, without costing substantially more in the future. “When you are selling fundraising for buildings, you are selling something that will be valuable in the future, but something that is based off of history,” Loscheider said. Loscheider even mentioned that the Board of Directors have increased their committed amount to the project, with 100 percent of the Board making donations toward the building. German professor Timothy Bennett said that, at first, he was seemingly neutral with the building of the facility. “I wasn’t thrilled, but I was somewhat neutral because we were promised repeatedly that the university would not break ground until all of the funding had been secured,” Bennett said. History professor Amy Livingstone, on the contrary, was quite thrilled about the athletic facility. Although Bennett’s feeling toward the HWA facility has changed after costs have risen, he says the project cannot be turned back. In 2015, Wittenberg ran into further financial issues during then-President Laurie Joyner’s reign. Cuts were proposed for a number of majors, and, due to this financial crisis, 26 faculty members lost their jobs. Health insurance as well as retirement plans have also dropped in amount of coverage. “It’s like we were just healing and they said, let’s go get infected again,” Bennett said. After briefly surfacing from these financial troubles, Bennett shared concerns about assuming debt to build the facility. Bennett listed a variety of impacts he sees coming for faculty and staff. “I’m afraid that they will talk about program elimination, salaries will continue to stagnate, and insurance costs will continue to rise,” Bennett said. Livingstone echoed many of the same concerns, while also adding that she was concerned about the consequences that faculty and staff will have to face, but not the Board of Directors. In the faculty meeting, Frandsen provided a broad outline for the project, as well as addressing other concerns with the Board of Directors. Although students, other than elected representatives, were unable to attend, Bennett mentioned that faculty and staff were frustrated with the rising costs and implications of the facility on the way faculty do their jobs. As the project continues, Bennett wishes that the project would be diminished, literally, to not only accommodate the athletic department, but to ease strain on Wittenberg’s budget. “I would rather they build something that they could afford to build,” Bennett said. Livingstone agreed, wishing that the facility would be reduced in size to place Wittenberg in a better financial situation. In response to these comments, Loscheider said that reducing the size of the building is nearly impossible at this stage of the process. These plans include three new classrooms along with a multi-purpose room, plus an exercise science room. Along with these rooms for academics, both professors and members of the athletic department will receive brand-new offices. Livingstone shared concerns of Wittenberg becoming too far out of the price-range for many students, driving prospective students to other schools because of the high price tag for Wittenberg. Loscheider, on the contrary, thinks of the addition of the HWA facility as a positive.